At LABEX of MA, our inventory of used and refurbished animal caging is unmatched and ranges from IVC vent-racks to individual cages. Small and large animal caging, Kennels, bedding disposal stations and animal transfer stations, as well as metabolic units are all displayed in our online catalog for your convenience. Our inventory of used and refurbished caging changes frequently, so please, feel free to contact us and visit our online catalog on a regular basis. We always make sure that the used caging and equipment we sell meets the requirements of The Guide for the Care and Use of Laboratory Animals, AAALAC, USDA guidelines and European Convention. We pride ourselves in our knowledge of the equipment we buy, sell, consign, or lease and offer a 30-day warranty on every transaction. 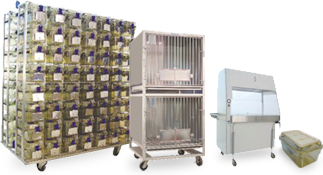 We regularly acquire high quality used caging and vivarium equipment through our network which consists of pharma, biotech, research organizations, and universities. Let us work for you, if we do not have what you need in our current inventory, we will query our contacts to quickly locate the equipment you need. We understand that rapidly changing research needs can stress your project timelines, equipment storage capacity, and your capital budget. For those instances we can facilitate a lease situation, we can work with you to create a flexible leasing plan. Please see our Lease Terms for more details. We are also interested in any unwanted inventory of caging and accessories and other surplus equipment your company may have available. With our help you will not have to rent additional space to storage unwanted equipment or use premium facility space that could otherwise be used to generate revenue. We will act as your broker to ensure you get the best possible return on your investment through our consignment services. We will partner with you, act as your agent, and provide you and the buyer with a win-win experience. Consigned equipment is inspected, repaired, if necessary, and may be stored in our facility, or can remain at your facility until sold or leased. Please take a moment to review our Consignment Agreement for more details.